And so we returned to Singapore, our eighth visit to this beautiful flower-garden country peopled by three distinct cultures with all their own foods, costumes, and languages, a country with expressways more cultivated than English gardens, and blossoms growing in profusion in every vacant lot! The Grand Central Hotel on Orchard Road screwed up our reservations (quite unusual for them...) and so wound up having to give us a luxury suite instead of our usual single room, but of course at the single room price. I don't mind that sort of screw-up! The following morning we ate warm, buttery, flaky croissants and buckets of black tea. So much for Singapore's three indigenous cultures; we opted for French before heading back to the airport for the next leg of our journey; the city of Balikpapan in East Borneo. Our hotel for the night was a modern (for Borneo) affair with several restaurants, a health club (mostly used by the ex-pat engineers living in the town working for the oil, mining, and lumber industries which abound in resource-rich Kalimantan. We had dinner at the hotel (opting not to have KFC,) dinning on Borneo deer prepared in spicy Indonesian fashion, and cold 'Bingtang' beer, (locally made, and pretty good stuff!) while chatting with several American and Canadian mining engineers eating at the table next to ours. The next morning it was back to the air port for another plane ride, (number three, each in successively smaller and smaller planes,) this time in a 'island hopper,' an 18 seat commuter with seats so small that Nobuko didn't even fit on it! Most men would need at least two to be comfortable. But at least the runway was paved. 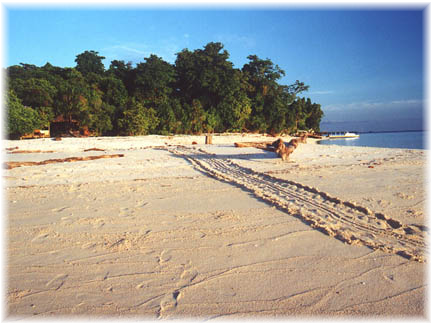 As was the landing strip in Berau. Surprise! That was a step up from the cow pasture we landed on last Christmas in the Philippines! In Berau, we were met at the airport by representatives of Borneo Divers who took us to a motor boat on one of Kalimantan's rivers for a two-hour ride through the delta out to sea, to the island of Derawan. Derawan is a small island off the coast, that has two dive resorts and a local village of 1,500 people who mainly support themselves by fishing. But we were only there to change boats for the next leg of the trip, and didn't get to really look around. Another 90 minute boat ride, in a still smaller boat, this time to "Paradise." Getting to some of our vacation spots takes work! Paradise in this case is called 'Sangalaki,' an island smaller than two football fields, no village, no roads, no phones, no nothing... except white sand beaches surrounding lush jungle, palm trees, unlimited clear blue skies, a large open air dinning/meeting room, a dive gear room, and 9 guest bungalows. (It took me less than 25 minutes to walk completely around the island, including frequent stops to admire the views.) 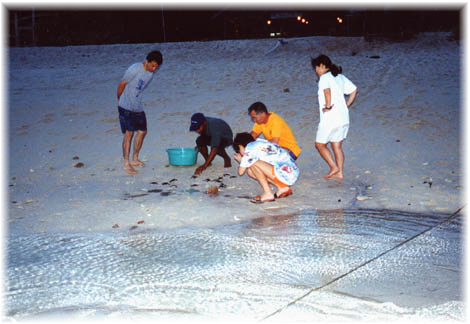 The sands are covered with the tracks of sea turtles, who come ashore every night to lay their eggs, anywhere from 30 to 100 turtles a night, sometimes digging their nests right under the bungalows. 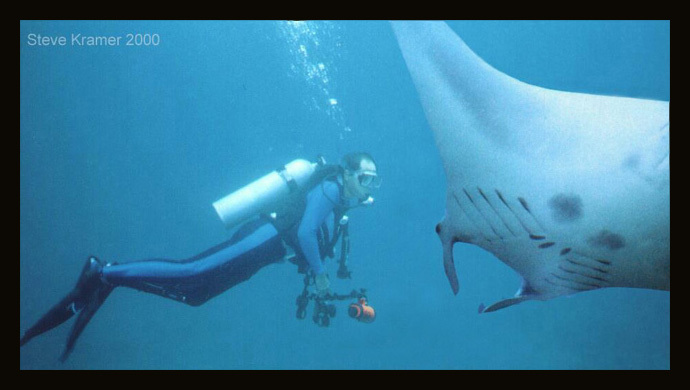 And the seas... the seas are filled with giant Manta Rays!! 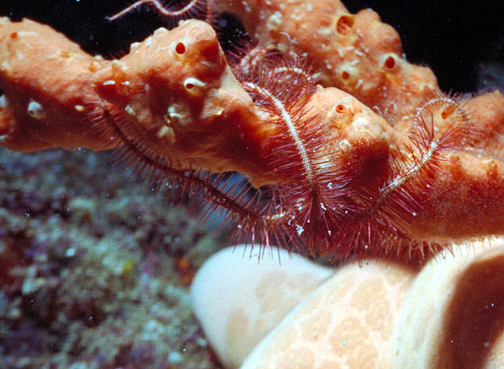 We'd see several on every dive. Turtles, sharks, jacks, travalleys, large Cuttlefish, sting rays, and all the small coral reef inhabitants imagined! Hi Mom! I'm home!! 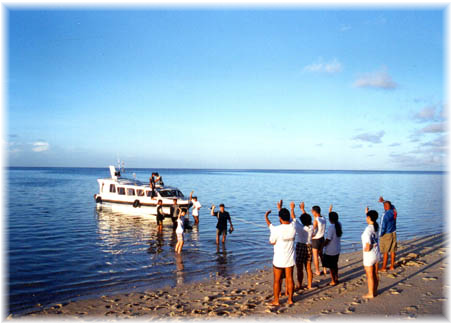 Many people believe that Yap is the best place for Manta watching, but in Yap the guides often require the divers to just sit in the sand and not move when the Mantas come in. 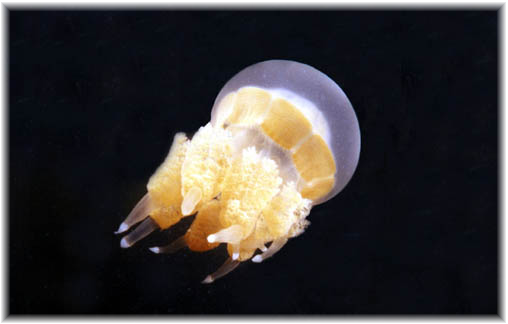 In Sangalaki, we could swim with them, play with them, swim around, under, over, etc., as long as we didn't touch them. 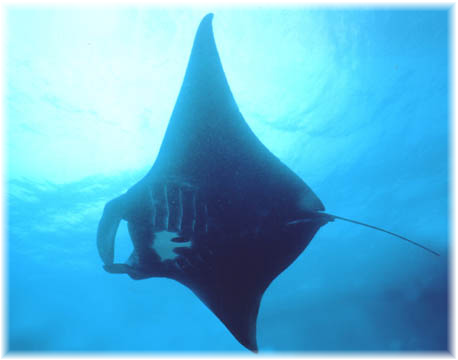 However, the mantas themselves would sometimes touch US by swimming close while were being stationary. 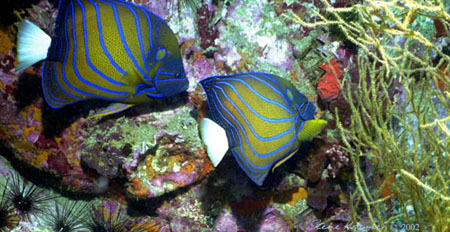 A real 'interaction' would occur between us on almost every dive! We had a lot of laughs about the various characters in rec.scuba, and spent the rest of the week diving together. An American from Boston, he was just one of the several divers in the Internet scuba newsgroups that I met this summer, an excellent diver, brilliant conversationalist (very welcomed on an island with few amenities,) an all-around pleasant fellow with whom to be trapped on a desert island! After a great buffet dinner of local fare, 'Kadek,' the head divemaster of the 'Sangalaki Dive Resort' run by Borneo Divers, gave us a complete briefing about the island itself (all sand and jungle,) the water supply (all imported daily,) the bungalows (with hot water showers and 240 electricity - from 4PM to 11AM only,) and the diving. We could make at least 3 boat dives a day. All gear would by brought to the boat by the crew members, except mask and fins. No boat would hold more than 8 divers (although there never were even that many on the island while we were there!) and we'd do back roll-offs for entry. We'd plan one hour dives but could extend times if desired. Boat rides would take about 5-8 minutes to each dive site around the island, and 15-20 minutes to get to nearby islands. We could expect to see manta and turtles on every dive, but no riding or even touching, please... unless the mantas come to touch you! The normal schedule was breakfast at 7:30-8:30, assembling for the first boat dive at 9:00, five minutes to the dive site, in the water for at least an hour, then up and back to the island. The second dive would leave at about 11:30 following the same drill. Then back for lunch and relaxation, with the third dive going out about 3:30. We were free to make as many beach dives as we wished, with tanks always available. If we wanted to make boat dives at night, all we had to do was request them! 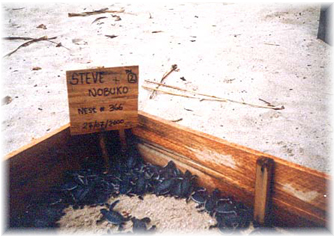 After the briefing, Manuel, Nobuko and I took a walk around the island, watching the turtles digging their nests and laying eggs. 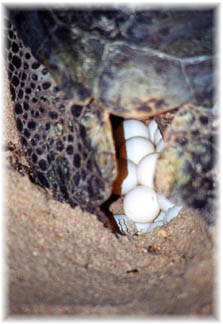 What an amazing feat of strength and endurance these turtles have, to heave their bodies 50-150 feet up the beach, then sometimes digging two or three different nests 3-4 feet across and 2 feet deep, to confuse predators, before finally digging the deeper egg chamber at the bottom of the nest. You can hear them huffing and puffing as they dig. It takes about 90 minutes from start to finish, and then covering the nest, they turn and head back into the sea. 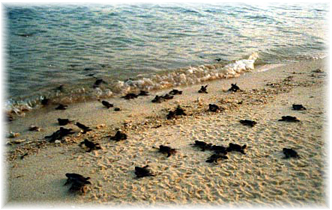 Unfortunately, Indonesia does not have any turtle protection laws, and even licenses out turtle egg collection territories. There were 4 young men living in a small shack on the back side of the island, and every morning at 6AM, these guys would circumnavigate the island, follow any new turtle tracks to the nests, dig up the eggs, and transport them back to the mainland for sale. They can get about $5 US for an average nest-full. However, money is money, and so for $20 US, (an outright bribe, but we were willing to pay to help protect future generations,) they would agree not to disturb a nest. 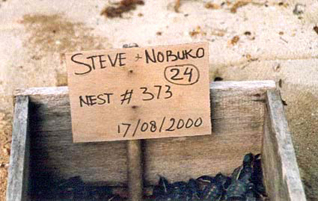 The Dive Lodge would put up a sign with the names of the 'sponsors,' and the date of laying, and the collectors would leave the nest alone, to hatch out two months later. There were at least 10 different nests so protected when we arrived, and we bought five more nests ourselves. We watched (and photographed) 'our' turtles laying their eggs, and Kadek (the divemaster) promised to photograph 'our' babies running off into the sea in two months! 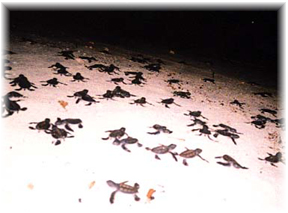 While we were on the island 4 different nests hatched, so we were able to also watch the other half of the process; the baby turtles doing their thing, making the incredible trek over dunes, branches, rocks, etc., around bungalows and beached boats, all the way back to the sea! Kadek places a wooden box around a nest just about ready to hatch, so that if the eggs do hatch during the daylight hours, the babies can be gathered up and protected until after dark when they will be released and have a better chance at survival when they make their run to the sea! Up at sunrise to greet the day, and after a perfect buffet breakfast of local foods deliciously prepared by the resort's chef, the three intrepid divers make their way to the dive boat! Nobuko, Manuel, and I were the only divers. I couldn't believe it!! 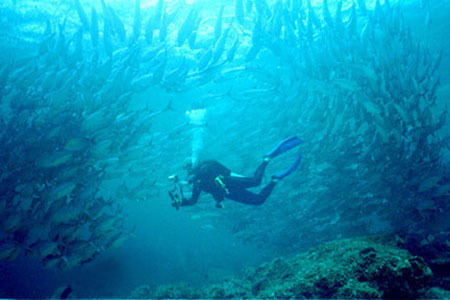 Here was some of the finest diving to be found anywhere in the world, and we have it to ourselves! So for our first dive of the day; Manta Cleaning Station! After a five minute ride outside the reef, the boat stopped, the crew brought our tanks over to where we were sitting, we kitted up, and rolled in! Straight down through clear blue water down to 70 feet and a sand bottom, with a single jumble of rocks and corals covered with soft corals, sponges, and a gajillion small reef fish awaiting their next customer. And not to be disappointed, no sooner do we settle in the sand at the base of the rocks, get our cameras set up, strobes aimed, etc., in come three Giant Manta Rays for a cleaning! 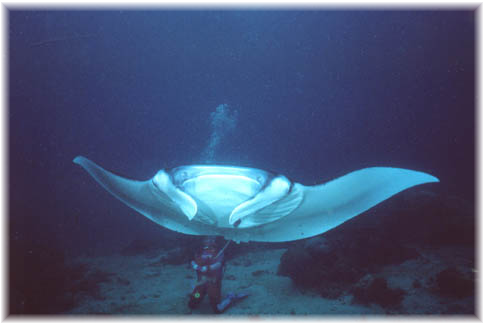 The station was only about 15-20 feet across, so the Mantas had to take turns on top of them, letting the small fish peck away at the parasites on their skins and in their gills. Each Manta was about 8-14 feet from wingtip to wingtip, and would hover over the rocks for a few moments, then drift out while the next one came over. 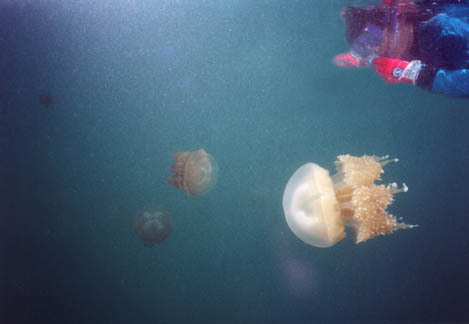 Sometimes all three would be there together, and they would block out the sun, swimming just a few feet over our heads. 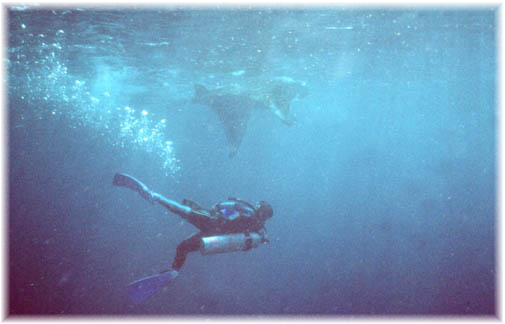 Every once in a while, one would swim down lower, and we'd be eye-to-eye with this huge gentle creature, just as curious about the strange twin-finned creatures in its home as we were about the huge winged fish with mouths like tunnels that we were watching. 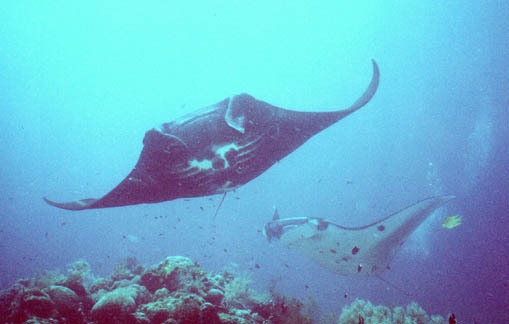 Quite often the mantas would come and play in our bubbles. They seemed to like the feeling of the bubbles on their bellies, and would circle around over and over to swim through them within arms reach over our heads. Having 14-foot flying Doritos hover two feet above you is a bizarre experience! Reminded me of a friendly "Independence Day..."
A day later, four more divers arrived on the island. (And then we were seven...) All were from Japan, and all were experienced divers. Very. Introductions all around, and once again serendipity rears her head, with one of the divers, a young man named Okamoto-san, saying "Are you the Steve Kramer who lives in Osaka? Uhhh.... yes.... "I always read your posts on rec.scuba!" More laughing about the characters in the scuba newsgroup! Okamoto-san doesn't post to the newsgroup, but reads it daily. 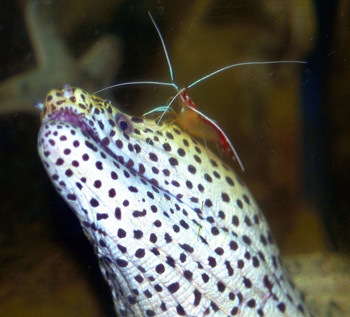 An excellent diver, his presence on each day's dives was always enjoyed by all! Add one older man named Nakane-san, and a young couple, the Masakis, to Manuel, Nobuko, and myself, and you have ALL the divers we found in Sangalaki! All I could do was grin and think about those California dive boats with their 60 divers and two DMs traveling out to sea for 12 hours to make two dives.... We had our own private island for just the seven of us, with a staff of 15 to wait on our every desire! We made many dives at the cleaning station, some times staying there the entire dive, watching different mantas come and go. Some with white bellies, others black, and still others with mottled colors. 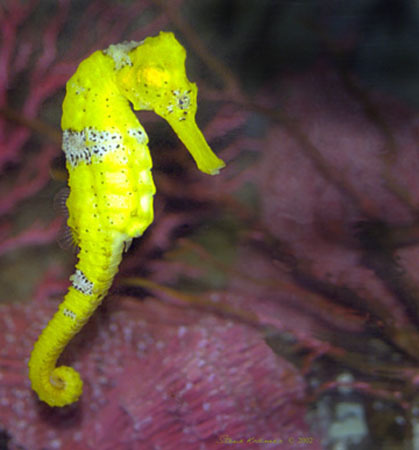 We came to recognize two of them, by color and scars or cuts on their fins, and even gave them names!! But other times, we'd drop in at other locations around the island, and see lines of mantas feeding close to the surface, their mouths wide open, scooping up the microorganisms floating in the water as they'd swim through. We'd follow them for a while, then drift off in a different direction enjoying the various habitats to be found in the seas surrounding Sangalaki. Watching giant Cuttlefish looking for all the world like the Goodyear Blimp, their changing colors, pulsating in vibrant displays unequaled anywhere! Daily dives at other sites such as Manta Parade, Lighthouse Reef, Manta Avenue, Coral Gardens (I think there is a "Coral Garden" dive site in every dive venue) were all just as rewarding. 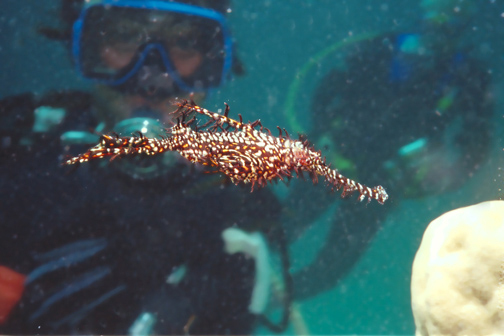 Sangalaki is truly a diver's Paradise. Schools of barracuda, jacks, travalley, Napoleon Wrasse, turtles, white tip sharks, etc., made up our daily dive partners, as well as all the standard smaller Indo-Pacific reef fish such as Moorish Idols, Sergeant Majors, Coral Banner Fish, a dozen different verities of Butterfly and Angel Fish, Three Spots, Fusiliers, Lion Fish, Harlequin Sweetlips, Clown Triggerfish, Titan Triggerfish, several species of anemone fish and Surgeon Fish, as well as a variety of nudibranchs, flat worms, tube worms, gobies, jawfish, soft corals, hard corals, Banded Cleaner Shrimp, lobsters, and of course, mermaids. Well, maybe we had to bring our own mermaids, but the other stuff was provided for us! 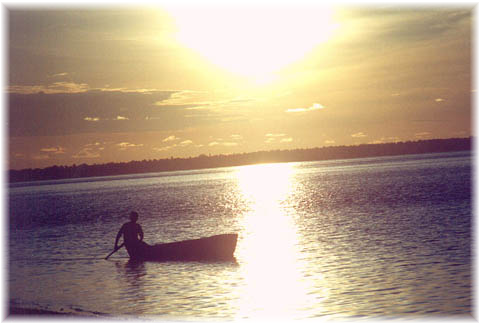 One day we went to the neighboring island of Kakaban., a 15 minute boat ride away. 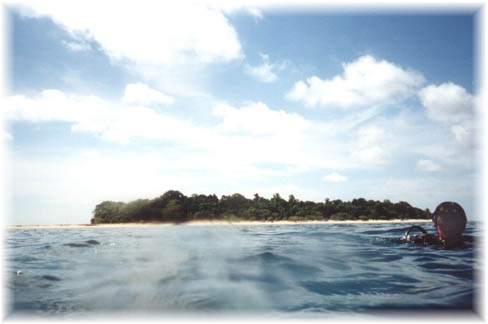 Kakaban is volcanic in origin, and thus has the 600 foot deep walls that Sangalaki lacks being a sand bar. Of course we didn't dive down to 600 feet, but the water was so crystal clear that you almost wanted to! But our first dive there was not down the wall anyway, but through a cave! This cave had it's entrance at about 20 feet down. A round hole going down, down, down into darkness. In the pre-dive briefing Kadek told us that the bottom of the cave was at about 270 ft. but we would only be going down to about 135 feet before entering a tunnel that extended laterally a little longer than a football field before opening to the sea along the wall. 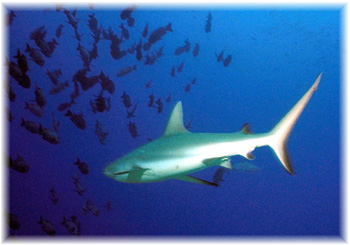 Just as we were about to enter this 'Black Hole,' a large Gray Reef shark darted past us and down into the darkness of the cave.... shades of Hollywood horror movies! Anyway, only Nobuko, Okamoto-san, and I chose to follow Kadek through the cave, while the others drifted the wall with the other divemaster, Bahrun. We've all had overhead experience and training, but we weren't carrying the proper safety gear (other than extra lights each,) so it was a bit foolhardy to do it. But that's what makes horse racing, I suppose. There was a fixed line in the tunnel, which reduced a lot of the risk. It was adventure, it got the adrenaline going, and we all lived through it, and loved the interesting shapes carved by years of water flowing through the limestone, carving out the tunnel. We never did see that shark again, but have wonderful memories of the cave. After exiting the cave, we joined up with the others drifting the wall, enjoying the giant Gorgonians (sea fans) covering it, while watching the big fish cruising for their dinner just off the wall. 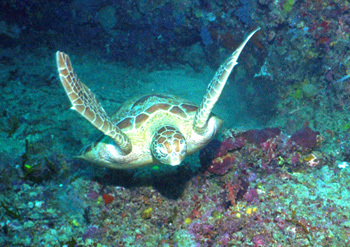 A very, very enjoyable dive site! During our surface interval, we climbed for 20 minutes up the steep, extremely sharp volcanic rock rim of the island, carrying masks, fins, and cameras, to a large saltwater lake filled with jellyfish!! Thousands and thousands of non-stinging jellyfish of three different species; it was impossible to move through the water without hitting dozens of them!! Very, very strange sensation, almost like being in an alien galaxy. There is a similar lake in Palau, but when we were diving there two years ago, the heat of El Nino had killed off all the jellyfish, and we never got to see them. This time, we saw them in spades!! In fact, a Royal Flush in spades! 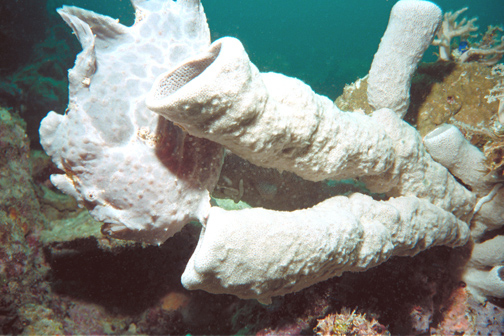 We snorkeled there for about a half hour, shooting an entire roll of film on these ETs of the sea. Coming down from the lake, we passed the hut of a coconut gatherer who was making copra (dried coconut for oil) and he offered us each several freshly cut baby coconuts. When we reached the boat and the beach, he hacked off one end with a machete, so we could drink the fresh cool water inside, then with spoons the divemasters had on the boat, we could scrap out the almost gelatinous baby coconut meat to eat!! This was the perfect 'pick-up' after diving. Beats the hell out of old, stale cookies and bad coffee! We made one more dive on the wall at Kakaban before heading back to Sangalaki for another great buffet lunch of Indonesian foods. The chef at the Dive Lodge was amazing with the creations she would prepare from simple ingredients. Some of the Japanese divers found them a bit too spicy for their pallet and quickly learned the trick of keeping the honey jar close at hand when eating too-hot foods. Unfortunately, the foods were so delicious that they couldn't stop eating them, so the honey came in handy often! Another afternoon dive around the island, but this time concentrating on macro stuff. There is plenty of it to be found too. 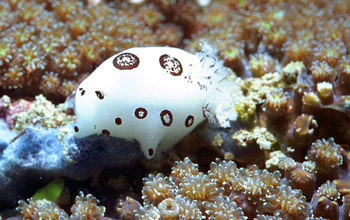 Besides the nudibranchs and other typical tiny stuff, there were miniature cowries, tiny sea-horses, tiny teeny crabs, etc. But the mantas kept wanting to get into every picture, the hams! Sangalaki promises mantas, and certainly delivers. 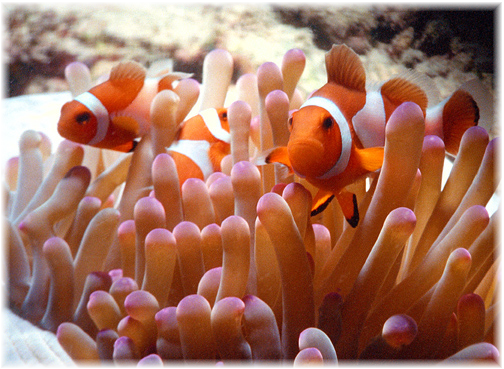 We saw them on EVERY dive, and always close enough for conversation! After the dive, I took a walk around the island just for a bit more exercise. Even though it only takes 25 minutes, ( including all the stops for pictures) walking in the deep sand that long is tiring! Evenings were spent, after another great meal of course, (and if not making another dive,) sitting around the dinning/meeting hall chatting, playing cards, drinking beer, reading and relaxing. A luck would have it, there was also a guitar to be played! Around 9:00PM Nobuko and I, along with one or two others would go turtle watching for an hour or so, or just watching the stars. It's a magical place and there are a lot of stars in the skies above Sangalaki, with the Milky Way being clearly visible, albeit criss-crossed often with shooting stars! We kept the wooden shutters opened in our bungalow when we went to sleep at night, (why not? The crime rate on an island with 7 people is pretty low!) and could watch the stars from our pillow until the sandman came to visit. ...Only to be awakened during the night by Mrs. 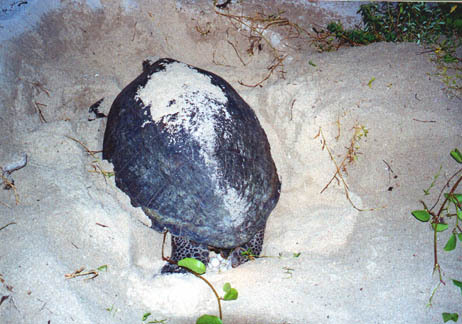 Turtle trying to dig her nest 4 feet away from my head! Well, what the hell. I figured she may as well lay them there as anywhere. At least I didn't have to go far to get my camera. Up again at dawn, ready for another day of paradise. (Manuel was leaving that afternoon, so no diving for him. Then we were six..) And another day of fantastic Borneo diving! 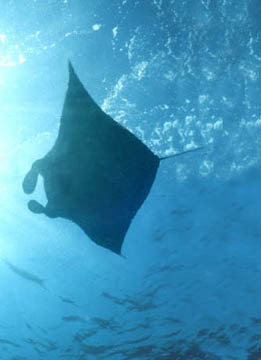 Blue skies, blue water, mantas everywhere, and good divers on the boat! But that evening in the lodge, Manuel's wit and wisdom were definately missed! He was headed for the island of Kapalai, just across from Sipadan for another few days of diving, and from all reports, enjoyed them too! And the next day, the young Japanese couple were leaving, so no diving for them. (And then we were four...) Four divers for the entire ocean!! God, I love it! The resorts at the island of Derawan often send their boats over to Sangalaki (never more than two boats at a time,) but we never dived the same side of the island that they were on, so it still felt like empty seas. Four divers and a divemaster who asks "where would you like to dive today?" We say, unanimously, Manta Cleaning Station! Two other divers have come over for the day, and the DM says that he will stay with them and drift between Manta Parade and Manta Cleaning Station, a distance of about 300 yards (3 football fields.) Okamoto-san decides that he will go with them, while Nakane-san says he will stay with Nobuko and me at the cleaning station and take photos. We three get dropped off first, and go down to the sand. 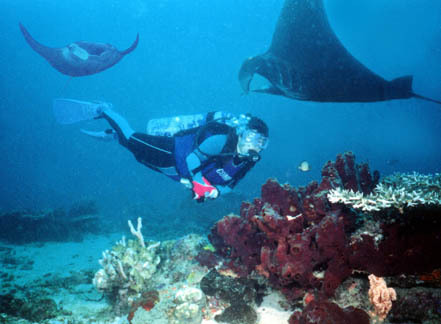 I moved into the rocks themselves, as the manta don't seem to mind our presence at all. 5 minutes later three or four manta arrive and the show begins. About 30 minutes later, I noticed that Okamoto-san has joined us, but I don't see the divemaster or the other two divers. I signaled my question to him, and he signed back that they went back to the boat with some sort of gear problems. We played with the mantas for another 30 minutes, looked at each other, sighed, signaled ascent, and rose to 15 feet for a three minute safety stop before surfacing. The boat was laying just off the site, came in and picked us up for OUR last dive of the Sangalaki Island part of this summer's diving adventure. We were here for one week. The first day and a half of diving there were 3 of us on the boat. Then 7 of us for the next three days, then 6 for a day, and finally 4 for a day. THAT is what I call a good dive boat! We had great weather every day (well, one rain squall while we were under water, but was clearing when we surfaced,) had fair to good viz at almost every site, saw all the stuff we were promised in the brochure, ate fantastic foods, slept in comfortable bungalows with hotwater showers (no air-con, but with all the open windows and island breezes, it was never missed,) had more than helpful divemasters and boat crews, and all in all, one hell of a great stay on Sangalaki. But at 3:30 in the afternoon, it was time to take a boat back to Derawan. All of the staff and the two remaining divers gathered at the beach to wave good-by (sort of reminded me of the TV show, 'Fantasy Island,) and we put out to sea. An hour and a half later we docked in Derawan. This time we took a walk around Derawan Island, (took much longer with it's village of 1,500 people) had dinner and went to bed in one of their bungalows. Frankly, although Derawan Dive Resort is a bit more 'up-scale' than Sangalaki, we both MUCH preferred Sangalaki! The food was better, the cabins nicer, and the people more friendly. But we weren't staying there long. After a skimpy breakfast at 5AM, we got on another speedboat along with three Swiss divers, and headed back to Berau for our flight back to Balikpapan. Nobuko and I had 6 hours to kill in Balikpapan before our flight from there to Singapore, more than enough time in hire a car for the day to take us into the middle of the town, to the market area, where we were able to get a great meal (several, actually, as we had no idea what we were ordering and ordered enough for five people) for about $2 US. 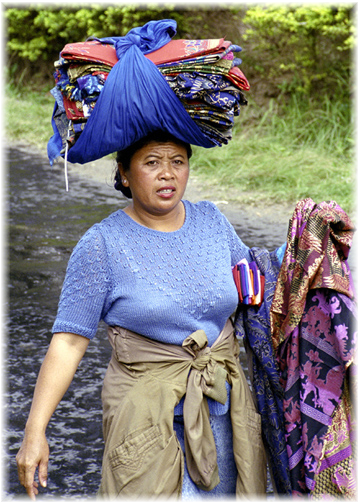 The Indonesian 'rupiah' is worth almost nothing; 8,700 rupiah equals one US dollar, and a 'good' monthly salary in Borneo is about 350,000 rupiah, or $40 US. The taxi driver was more than happy to wait for us for the $7 US I promised him, and even happier still when I gave him $10, then absolutely ecstatic that I gave him a US $10 dollar bill which he could convert to even more on the black market! Back to the airport, avoiding a very clever 'get-rich-quick' scheme two of the porters had come up with using our over-weight bags, ("that will cost you $312 US dollars, sir. Just give it to us and we'll see that everything is taken care of for you at the counter, sir. No problem, sir." I politely declined, went to the counter myself, and paid the $12 US overweight fee,) and a quick flight to Singapore.